Hetter Heating & Cooling hired former military police sergeant Joe Wilson in the fall of 2014. Joe had served two years in Afghanistan in the U.S. Army & was wounded in the fall of 2011. His life was saved by the quick action of the U. S. Army medics who were near by when he was shot in the arm & leg while on patrol. After multiple surgeries, Joe was released from the Army & returned home. Joe grew up in Columbus & began attending a trade school shortly after his arrival to become an HVAC technician. Hetter interviewed & hired Joe in the fall of 2014. When you first meet Joe, you are struck by how respectful he is. With any ex-military you naturally think first – thank you – and second – God only knows what you have witnessed & experienced. Joe has a healthy respect for being alive. "Your service specialist Joe Wilson performed my spring inspection today. I must say the he was so impressive! He reviewed the results with me, item by item. You have a real professional on your staff! Then I found out that he is ex-military and a veteran of the Afghanistan War! That helped explain a lot about how he dealt with this job. He's a winner! Congratulations on your hiring choice." 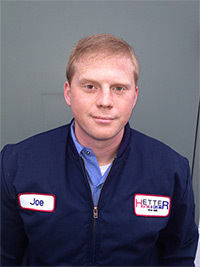 After six months of on-the-job training at Hetter, Joe was issued his own company truck & put out in the field as a fully qualified & NATE certified technician. Customers loved him. Joe loved his job. All was good for him & his family (wife & three children). Since the events of Afghanistan that changed his life, Joe suffered quietly with pain. Through his transition back to the U. S., his schooling in HVAC & his apprenticeship at Hetter, the pain grew, but Joe kept quiet. Finally, after many, many discussions with his wife & family, Joe made a decision. What he loved to do was just not possible. Joe returned to Hetter briefly in early 2016 as our warehouse delivery man but balancing school and home life became too much. He has however inspired our company management to initiate a relationship with the U.S. Department of Veterans Affairs. For every installation in 2017, Hetter will again donate $25 to the VA to help bridge the money gap in what the federal government can approve & actually what the veteran needs. In 2016, Hetter donated over $10,000 to the VA in the name of Joe Wilson. Thank you Joe and all veterans for your sacrifice & service.